Ulaanbaatar, October 16 (MONTSAME) The head of the working group for assessing the observance of duties by Oyu Tolgoi LLC before the Government of Mongolia, S.Ganbaatar MP called a meeting on October 15. Present at the meeting were also the members of a working group for investigating the over-consumption of investments by Oyu Tolgoi LLC. The group was established in accordance with the joint resolution (March 25 of 2013) by the Deputy Minister, the Minister of Mining and the Minister of Finance. The working group for assessment includes officials from Ministries of Mining and Finance, from General Customs Office, General Department of Taxation, Commission for Settlement of Disputes, Department for Specialized Inspection, National Audit Office and "Erdenes Oyu Tolgoi" state-owned company. During the meeting, S.Ganbaatar MP requested the members to present of R&E results on Oyu Tolgoi LLC and a status report on acts by audit and tax officers regarding the company, and reports on shareholders' loans. Answers were given by B.Battsetseg, a department head of the Ministry of Finance, A.Enkhbold, the vice-chairman of the General Department of Taxation, B.Badral, a head of department for tax administration and cooperation of the Department, and other tax officers. October 15 (American Banking & Market News) Investment analysts at Cowen and Company reduced their price target on shares of Turquoise Hill Resources (NYSE:TRQ) from $10.29 to $9.89 in a note issued to investors on Wednesday. The firm currently has an "outperform" rating on the stock. Cowen and Company's price target points to a potential upside of 200.61% from the company's current price. Turquoise Hill Resources (NYSE:TRQ) traded down 5.19% on Wednesday, hitting $3.29. The stock had a trading volume of 4,179,876 shares. Turquoise Hill Resources has a 1-year low of $3.01 and a 1-year high of $4.36. The stock's 50-day moving average is $3.63 and its 200-day moving average is $3.61. The company has a market cap of $6.620 billion and a P/E ratio of 1735.00. Oct. 16 (Bloomberg) -- SouthGobi Resources Ltd. says weak coal prices and sales to China are hitting margins and liquidity and the company may not have sufficient funding for the balance of 2014, according to a statement to the Hong Kong stock exchange. October 14 -- We address this letter directly to you as Prime Minister of Mongolia, as co-signatory of Resolution #216, head of the Mongolian Government responsible for Cabinet changes to Ministries involved in the resolution of the 106-license dispute, the reference to this dispute in your September 8th national address and publically stated initiatives to improve the economy and revive FDI. Over 100 days have passed since Resolution #216 was approved, over 160 days since this issue was raised to your "100 day plan" committee, and the lack of progress relating to resolving this dispute has, and continues to, cause further damage to former license holders, Mongolia's international reputation and private sector investment and activities. This is clearly at odds with the state objective of Resolution #216 and public comment from Government officials. It highlights either a lack of capacity or intent to resolve this dispute and a politically driven environment that supports this dispute extending now to over 20 months with little meaningful process likely in the near to medium term that would support resolution to key licenses and a much needed improvement towards investor confidence and activity. To date, only four licenses of the impacted 106 have been successfully retendered, noting under questionable circumstances, and the majority of impacted groups and licenses haven't made any progress advancing towards resolution due to a lack of accountability and understanding of the proposed process from the various different Government Ministries, officials and departments. This later situation is now impacted by initiatives lead by you, the Prime Minister, to reshuffle the current Cabinet, directly impacting the two Ministries involved in the resolution of the 106-license dispute. Despite repeated statements from senior Government officials that the 106-license matter is being resolved without further loss to former licenses holders and is a priority for resolution, the lack of action to date best illustrates the current process and statements being little more than a public relations exercise with minimal substance. i. Limited action to date: the first 4 licenses returned (October 6th), of the initial retender of 14 licenses (September 22nd), had previous investment of only totalled US$0.6 million (for the total 14, only US$1.65 million of "approved" costs). There has not yet been the announcement of a second or any other tender for other impacted licenses and no other licenses have had their previous costs yet agreed with the Government dispute often providing all the required and requested documentation. For only 31 of the 106 licenses, which are represented by members of the association of active former license holders, US$19 million has been invested, approximately the scale of Khan Resources in-country, currently seeking over $300 million in compensation via international arbitration, and a further US$36 million investment planned from 17 of 24 companies. It is apparent that the first 14 licenses put to tender were just the easiest from an administrative perspective, with little or not previous exploration, and that no progress has been made for licenses which are relatively advanced, prospective and experienced more meaningful previous investment. Such a situation means that investors and market participates are still waiting to see how the meaningful licenses are resolved, and discounted any "progress" in the limited actions made to date. As such investment and private sector activities continue to deteriorate. Of the first 14 licenses, 10 have to have a second retender, again, an overly complex and administratively lead process which doesn't look to efficiently resolve this dispute or minimize continued damage to former license holders. ii. Uncertainty relating to previous costs: There continues to be considerable uncertainty relating to what costs incurred by the former licenses will be recognized by the Government. This is critical to determine the "threshold price" which acts as the minimum required tender price and potential compensation level to former license owners. The process for agreeing costs is not transparent with some groups having had some elements of costs, such as acquisition costs, accepted while others are yet to. We note that it is proposed that the costs that are being accepted and recognized by the Government are often significantly less than the actual costs related to previous exploration activities undertaken, excluding the concept of cost of capital, interest costs or future economic benefit, the later points which are critical considerations for investors particularly when undertaking exploration activities. iii. Uncertainty relating to process: The stated purpose of Resolution #216 is for such a retendering to be undertaken in an open, fair and transparent manner, with due notification of the re-tendering to be made. The tender rules do not clearly proscribed for what occurs under the situation where there are two or less bidders and how former licenses holders actually regain their licenses. As illustrated by 10 of the first 14 licenses, a subsequent and second tender process is required. Why is a second re-tender of the same license area required under the same process if the first re-tender went through the correct process in an open, fair and transparent manner? Surely under such situation, then the license should be returned to the sole bidder and former license holder without the need of a second, subsequent retender? Furthermore, nowhere is it proscribed in writing that even after a second tender, that the license will be returned to the former license holder if they participated in both tenders? Such a slow and non-transparent process supports a political, administrative and public relation driven motive rather than commercial looking to actively return key licenses, support private sector activities and FDI, and conclude a relatively simple dispute to assist restore Mongolia's international reputation as a destination for investment, that continues to negatively impact investor sentiment toward, and investment in Mongolia, and unfortunately undermines statements and creditability of a timely resolution being achieved. Investors, the media, analysts and other market participants are paying particular focus for the resolution of key licenses where significant funds were previously invested and those which have public market disclosure requirements. Given the situation we find ourselves, the time period lapsed, the lack of accountability and decision making from various ministries and now ministerial change, we request direct guidance from your office in this matter. Former license owners have been negatively impacted by this dispute for over 20 months, including over 12 months since this matter was put into the hands of the Government following the initial various criminal court processes against former government officials. While former license holders have already incurred significant damage and loss, and continue to, from the actions relating to these licenses being revoked and the time it has taken to this point, however, we highlight that the ongoing delay, current procedural process and uncertainty relating to the resolution of this issue is now having a greater impact to the Government and Mongolia's reputation, than the economic interests of the former licenses holders. The association of active former license holders continues to advocate for an equitable and timely resolution that is in the interests of all stakeholders. October 17 -- Xanadu Mines Ltd (ASX: XAM – "Xanadu") is pleased to announce that diamond drill hole KHDDH356 intersected near-continuous, high-grade copper-gold mineralisation from surface. The drill hole details are set out in Table 1 and assay results in Table 2. A plan, long section and cross section are included in Figures 1, 2 and 3 respectively. October 15 (Proactive Investors) Aspire Mining (ASX:AKM) and Noble Group have determined seam continuity over a 1.2 kilometre strike at their Nuurstei Coking Coal Project in northern Mongolia after intersecting coal in 11 additional holes. Shares in the company should trade higher after the company intersected near surface coal in multiple seam packages. The best intersections included 9.77 metres from 48.3 metres and 9.5 metres from 53.8 metres. Drilling also identified a separate near surface coal deposit to the west of a major fault dips in a separate direction to the north. In addition, a PQ diamond core hole is being completed as a coal quality indicator and coking coal analysis will be done on various coal seams. The 17 hole drilling program for 2014 is now complete. In addition, 7 holes from the 2011 program were re-opened and geophysically logged. The 2014 drilling programme at Nuurstei achieved its goal of testing and confirming coal continuity along a 1.2 kilometre strike on a northwest-to-southeast orientation with coal dipping an average 50 degrees to the south west. The area is faulted with a number of north-south faults crossing the deposit and exposing surface coal outcrops. In addition, a separate near surface coal deposit to the west of a major fault dips in a separate direction to the north and this will be further investigated in 2015. Drill hole data will now be assessed and an exploration program developed to test resource continuity of coal, and to target near surface coal resources which could support a road-based trucking operation. The last 11 holes all intersected coal seam intervals, some with claystone partings, although there was a noticeable thinning of seam thicknesses to the northwest. Coal quality testing will be required to confirm ash and coking properties. Down hole geophysics indicates that parts of the coal seam intervals should be low to moderate in raw ash levels, indicative of a possible coking coal fraction. The Nuurstei Project is located about 10 kilometres to the southwest of Moron, the capital of the Khuvsgul province in northern Mongolia, and 160 kilometres east of Aspire's wholly-owned Ovoot Coking Coal Project. In addition, the project could also become a user of the Northern Rail Line, a new rail development project earmarked for Northern Mongolia which will link through to export markets. That the remaining 11 holes at the Nuurstei Coking Coal Project have confirmed seam continuity over a 1.2 kilometre strike highlights the prospectivity of the project. Results of this exploration programme will be assessed to identify new drilling targets for 2015. That near surface coal continues to be intersected further supports its potential for an open put mineable resource. This could support a small road based trucking operation that could provide the company with early cash flow ahead of the construction of rail infrastructure. The successful 2014 program confirms Northern Mongolia's Selenge Basin as a potential new coking coal province with a new railway planned to deliver this coal to world markets. The Nuurstei project could also become a user of the Northern Rail Line, a new rail development project earmarked for Northern Mongolia which will connect the region to export markets. Aspire is also continuing to progress its advanced Ovoot Coking Coal Project. October 17 -- Wolf Petroleum Limited (ASX:WOF, "the Company") is very pleased to announce that it has reached an agreement with CPS Capital Group Pty Ltd to underwrite a rights issue to existing shareholders on a 1 for 8.7 basis at an issue price of $0.05 per share (approximately 30,000,000 shares) with a free attaching WOFOA option to raise $1,500,000 before costs. This offer will allow the Company to continue its negotiations with potential strategic partners and provides shareholders an opportunity to maintain their exposure to the significant upside presented by the Company's petroleum assets in Mongolia. Funds raised under the rights issue will be used to meet existing financial obligations under production sharing contract with the Government of Mongolia and to focus on closing the farm out process on SB Block. The Company's 100% owned SB Block provides an exciting opportunity to international oil companies with an estimated 460 million to 2.2 bil­lion barrels of oil in resources. A Prospectus setting out the details of the offer will be lodged with the Australian Securities and Investments Commission and the Australian Securities Exchange on or about Friday 17 October 2014. Wolf Petroleum remains the largest petroleum acreage holder in Mon­golia with over 18 million acres under license in three highly prospec­tive petroleum blocks. The shares have been granted in full and final satisfaction of amount owing to Mongolian creditor. The Board has resolved to extend the Closing Date of the Public Offer and the Closing Date of the Vendor Offer from 15 September 2014 to 15 October 2014. * The above dates are indicative only and may change without notice. The Company reserves the right to extend the Closing Dates or close the Offers early without notice. VANCOUVER, BRITISH COLUMBIA--(Marketwired - Oct. 15, 2014) - Prophecy Coal Corp. ("Prophecy" or the "Company") (TSX:PCY)(OTCQX:PRPCF)(FRANKFURT:1P2) has entered into a binding letter agreement (the "Letter Agreement") with Apogee Silver Ltd. ("Apogee") (TSX VENTURE:APE) to acquire the Pulacayo-Paca silver-lead-zinc mining project in Bolivia (the "Pulacayo Project"). Ulaanbaatar, October 15 (MONTSAME) At the Stock Exchange trades on Wednesday, a total of 23 thousand and 496 shares of 17 JSCs were traded costing MNT 19 million 881 thousand and 569.00. "Ulaansan" /14 thousand and 814 units/, "Remikon" /4,100 units/, "Genco tour bureau" /1,875 units/, "Khokh gan" /1,611 units/ and "Mongolia Telecom" /212 units/ were the most actively traded in terms of trading volume, in terms of trading value were "Ulaansan" (MNT 14 million and 814 thousand), "Darkhan nekhii" (MNT one million 017 thousand and 500), "Talkh chikher" (MNT 840 thousand), "Gutal" (MNT 745 thousand and 500) and "Remikon" (MNT 467 thousand and 400). The total market capitalization was set at MNT one trillion 572 billion 020 million 146 thousand and 346. The Index of Top-20 JSCs was 15,682.10, decreasing 21.20 units or 0.14% against the previous day. Ulaanbaatar, October 16 (MONTSAME) At the Stock Exchange trades on Thursday, a total of 8,947 shares of 20 JSCs were traded costing MNT 14 million 297 thousand and 857.00. "Hermes center" /3,645 units/, "Remikon" /1,550 units/, "Khokh gan" /1,432 units/, "Baganuur" /910 units/ and "Hai Bil Oil" /720 units/ were the most actively traded in terms of trading volume, in terms of trading value were "UB hotel" (MNT five million and 380 thousand), "Baganuur" (MNT three million and 105 thousand), "Darkhan nekhii" (MNT one million 387 thousand and 500), "Tavantolgoi" (MNT one million and 205 thousand) and "Hermes center" (MNT 605 thousand and 130). The total market capitalization was set at MNT one trillion 566 billion 622 million 664 thousand and 027. The Index of Top-20 JSCs was 15,614.54, decreasing 67.56 units or 0.43% against the previous day. October 13 (BDSec) BDSec JSC's Shareholders approved to issue additional shares equal to 35.29% of the company's outstanding shares through its Annual General Meeting on April 18, 2014. As the company's existing shareholders were given preemptive rights to purchase the newly issued shares before a public issue. 32.61% of the total issue or 1,956,625 shares worth of MNT 3,778,242,875 have been subscribed by the existing shareholders. The majority of BDSec's shareholders including "Firebird Management" of USA, institutional and individual investors from Japan, Germany and Turkey have all exercised their preemptive rights. It simply proves that foreign investors are still committed and confident of the future potentials of the Mongolian capital markets. BDSec would like to express its sincere gratitude to all of the shareholders who have participated in the rights offering. BDSec CEO, Mr. Dayanbilguun.D said: "The fact that our shareholders have once again proved their commitment to BDSec gives an opportunity not only to us but also to the market itself as we will use the raised funds to bring domestic companies to the capital markets which could be a driving force in today's market conditions." The Company plans to offer the remaining 4,043,375 shares to public at MNT 2,146 per share or above, and finish the offering by the last week of November. Investors are able to purchase the shares by submitting a sample order form to their broker before November 24, 2014. Use of proceeds will be used to further strengthen BDSec's investment banking activities by helping domestic companies to raise necessary investments. October 16 (Bank of Mongolia) On the Foreign Exchange Auction held on October 16th, 2014 the BOM has received bid offer of 45.8 million USD as closing rate of MNT 1849.00-1853.00 and 124.7 million CNY as closing rate of MNT 301.55-302.42 from local commercial banks. 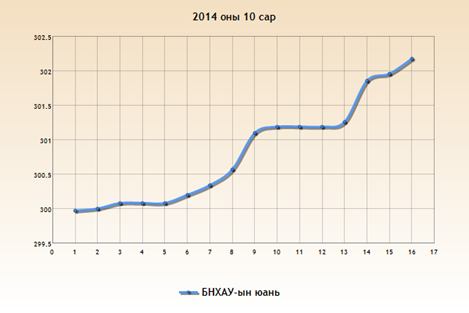 The BOM has sold 16.0 million USD as closing rate of MNT 1851.20 and 61.2 million CNY as closing rate of MNT 302.20. On October 16th, 2014, The BOM has received MNT Swap agreement ask offer in equivalent to 125.0 million USD and USD SWAP agreement bid offer of 3.5 million USD from local commercial banks and accepted all offer. October 14 (infomongolia.com) The irregular Cabinet meeting of the Government was held today on October 14, 2014 and it was resolved to take back the bill on 2015 State Budget. The decision was made due to Government restructuring issues being discussed these days, which anticipates to be revised at nearest plenary session of the State Great Khural (Parliament) and re-submit to the Parliament as soon as new structure of the Government of Mongolia will be approved along with new Ministers appointments. The draft bill on 2015 State Budget and relevant regulations were submitted to the Parliament on October 01, 2014. October 15 (BoM/MoF) Auction for 12 weeks maturity Government Treasury bill was announced at face value of 20.0 billion MNT. Face value of 20.0 billion /out of 35.3 billion bid/ Government Treasury bill was sold at discounted price and with weighted average yield of 15.470%. Ulaanbaatar, October 14 (MONTSAME) In the third quarter of this year, the index of apartment price in the city's six districts increased by 2.2 times against end of 2010, by 10.2% against the previous year, and by 2.8% against end of this year, but there was no difference against the previous quarter. Compared same period of the previous year, the apartment prices rose by 14.0% in Khan-Uul district, 11.7%--in Bayangol district, 10.0%--in Bayanzurkh district, 9.9%--in Songinokhairkhan district, 9.1%--in Sukhbaatar district, and 6.0%--in Chingeltei district. This price increased by 5.8% in Khan-Uul district, 3.0%--in Bayangol district, 2.9%--in Songinokhairkhan and Bayanzurkh districts, 2.8%--in Sukhbaatar district, whereas it declined by 0.5% in Chingeltei district against the end of the previous year. Moreover, the price of apartments increased by 2.1% in Khan-Uul district, 0.5%--in Bayangol and Sukhbaatar districts, whereas it decreased by 0.2%--in Bayanzurkh, 1.0%--in Songinokhairkhan, and by 1.3%--in Chingeltei district against the previous quarter. In the first three quarter of this year, the prices of apartments put into use before 1970 increased by 1.6-12.1%, the apartments put into use between 1970 and 2001--by 7.8-14.5%, and the apartments built after 2002--by 10.9-15.4% against the previous year. The prices of apartments built before 1970 declined by 0.2-2.0% in Songinokhairkhan, Chingeltei, Bayanzurkh, Bayangol and Sukhbaatar districts, whereas it increased by 2.0% in Khan-Uul district in first three quarters of this year against the previous quarter. As of Sep 2014 the total cumulative trade turnover increased by 1.8% (USD 144.8 millions) from that of the previous year and reached USD 8,068.1 millions. The increase in the trade turnover was due to the increase in exports by USD 924.0 millions. The structure of the trade flows with the neighboring trade partners is as following: (i) trade with PRC: 61.4% or USD 4,956.7 millions and (ii) trade with Russia: 15.3% or USD 1,232.6 millions. The trade volume between Mongolia and China increased by 22.7% and the trade volume between Mongolia and Russia increased by 2.9%. As of Sep 2014, the cumulative trade balance decreased by 98.6% (USD 1,703.2 millions) from that of the previous year and reached USD –24.4 millions. During the reporting period the total exports increased by 29.8% from that of the previous year, imports decreased by 16.1% from that of the previous year, thus the trade balance improved by USD 1,703.2 millions. As of Sep 2014, the trade balance of paid trade flows reached USD 213.7 millions. During the reporting period, paid imports decreased by 16.0%, and paid exports increased by 28.0% from that of previous year. As of Sep 2014, terms of trade index (2012 base year) increased by 8.5% from that of the previous year and reached 1.585. This increase in the terms of trade is mainly attributed to the decrease in import prices of durable consumer goods, fuels, machinery and equipment. The share of mineral exports in total exports decreased by 0.3 points from that of the previous year and reached 87%. Exports of coal, copper concentrate, iron ore and concentrate and crude oil have a weight of nearly 78% of total exports and 89% of mining exports. In addition, these 4 products' share in the mining exports in-creased by 4.8 points from that of the previous year, share in the total exports increased by 3.9 points. Mongolian export increased by 29.8% from that of the previous year, which was mainly affected by 29.4% increase in mineral exports. Exports of copper concentrate and crude oil increased by 148% and 43%, respectively, which accounted for 43% in growth of mining export. On the other hand, coking coal and iron ore export decreased by nearly 19%, 34% respectively, which accounted for 12% decrease in the growth of mining export. As of Sep 2014, Mongolian export increased by 924.0 million USD from that of the previous year. It is affected by the increase of export commodities' quantities (USD 952.3 millions) and decrease in export commodities' prices (USD 28.3 millions) . Because of the increase in crude oil and copper concentrate quantities, mining export increased by 870 millions USD. On the other hand, because of decrease in prices of coal, iron ore and de-crease in quantities of iron ore, zinc ore mining export declined by 476 million USD. Cashmere, cashmere products and other exports increased by 36.5 and 90.4 million USD respectively. As of Sep 30 2014, gold price reached 1,208.2 USD, decreased by 9.1% from that of the previous year and by 6.1% from that of the last month. 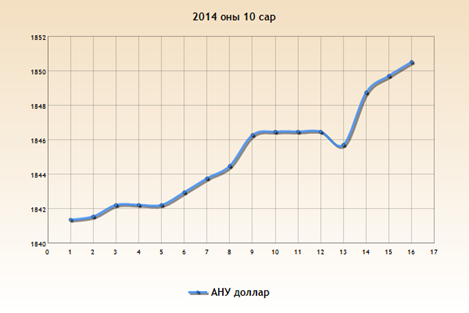 As of Sep 30 2014, copper and iron ore prices reached 6,720.0 and 78.0 USD, decreased by 4.1%, 11.3% from that of the previ-ous month respectively. Copper price decreased by 7.8%, iron ore price decreased by 40.6% from that of the previous year. As of Sep 2014, 25% of total imports were consumer goods, 42% were capital goods and 21% were fuels. Share of consumer goods in total imports increased by 2% from that of the previous year and share of the capital goods decreased by 5% from that of the previous year . And the share of fuels stood at the same level. Mongolian imports decreased by 16.1% from that of the previous year. Main contributors of this decrease were capital goods decrease, which equals to 12% of the total decrease, and oil imports which equals to 3% of the total decrease. Capital goods and fuels imports decreased by 25% (566 millions USD) and 14% (137 millions USD) respectively. Thus total import decreased from that of the previous year. Consumer goods import decreased by 9% (105 millions USD) from that of the previous year. Main contributors of this decrease were durables goods, in particular decrease in passenger car imports. Capital goods import decreased by 25% (566 millions USD) which was mainly contributed by 40% decrease in machinery, equipment and supplies (586 million USD). On the other hand, import of construction materials increased by 6% (35 million USD). Intermediate goods and industrial materials import increased by 4% (20 millions USD). The main contribution was 41% in-crease in electricity (27 millions USD). Fuels import decreased by 14% (137 millions USD). The oil price on the border decreased from beginning of 2012 to august 2012. Since then, the oil price increased slightly, but from October 2012 it is decreasing slowly. (Figure 8). Even though the import growth of non-durable consumer goods was relatively stable, that of durable consumer goods was declin-ing by the bigger phase. 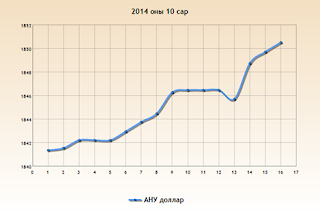 MAD: Mongolian Economic Update – Q4 2014: Bottoming Out? October 15 (M.A.D. Investment Solutions) We are pleased to announce that M.A.D. 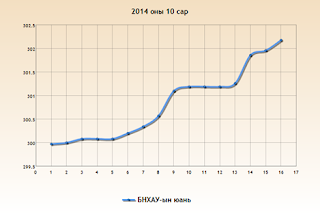 has now completed its H2 2014 economic and real estate update. The document is part of a regular series of updates that is published to our clients, readers and investors regarding our own views on the current state of the Mongolian economy and its real estate market. We look at historical data and significant events and draw predictions for the coming 6 months. We also generally include a set of recommended actions to be taken by the GoM and MUB that we feel would improve the current environment, address some of the challenges and pave the road towards a more sustainable market place. Ulaanbaatar, October 16 (MONTSAME) Parliament session on October 16 discussed draft resolution on freeing some officials from posts of cabinet members and voted on each of the Ministers. In view of the recently approved drafts on amending the laws on Government, on Government structure and on the Government composition, heads of three Standing committees gave reports on their conclusions: to free Ch.Ulaan from the posts of member of cabinet and Minister of Finance, L.Bold--of member of cabinet and Minister of Foreign Affairs, Ts.Bayarsaikhan–of member of cabinet and Minister of Construction and Urban Development, A.Gansukh–of member of cabinet and Minister of Roads and Transport, D.Gankhuyag–of member of cabinet and Minister of Mining, N.Batbayar–of member of cabinet and Minister of Economic Development, and M.Sonompil–of member of cabinet and Minister of Energy. The MPs questioned the Prime Minister on reasons of making such changes and voted a majority for the approval of the draft resolution. October 15 (infomongolia.com) Today on October 15, 2014, Minister of the Cabinet Office of the Government of Mongolia, MP Ch.Saikhanbileg presented a draft bill on "Appointing New Members of the Cabinet, Dismissing Incumbent Ministers" to the Speaker of the State Great Khural (Parliament) Z.Enkhbold. Last Wednesday on October 08, 2014, the Parliament of Mongolia approved a bill to diminish current 16 Ministries to 13, whereas six Ministries were merged into three Ministries. Therefore, above mentioned six Ministers are dismissed and the three names promoted will be discussed at the Parliament for approvals, which is expected tomorrow. Ulaanbaatar, October 16 (MONTSAME) Head of the parliamentary Standing committee on justice D.Ganbat Thursday received Ms Frederike Witte, a consultant of the German Society for International Cooperation (GIZ) in the State House. Many things should be learnt from Germany, Ganbat said, noting that his Standing committee is discussing several bills, including a first draft on "Law". Then he exchanged views with the guest on some issues. Ms Witte said she has visited Mongolia for the 16th time, serving as an advisor to Mongolia's Ministry of Justice since 2008. She said Mongolia's parliament is discussing a number of vital draft laws and is especially working on the bill on "Law". "This is a wide range bill. By it, any bills or amendments shall be submitted to parliament after having overcome specific criteria," she underlined. Present at the meeting were L.Zaya, a GIZ project manager on enhancing a sustainable legal environment for economy; B.Baasandorj, head of the Policy Department of the Justice Ministry; E.Tuvshinjargal, a chief advisor to the Standing committee on justice; and other officials. Ulaanbaatar, October 13 (MONTSAME) The Minister of Mining D.Gankhuyag MP Monday submitted to parliament a draft law on transparency of the mineral sector. Geographically, Mongolia is located in a mineral wealthy zone, and the state used to manage all authorities related to the mineral resources and exploitation before the year 1990, "since then, the private sector has been enjoying the right to explore and exploit minerals thanks to the transmission to the market economy system, and, due to increase in a number of such enterprises, the state budget is accumulating its specific part from the mineral industry," he said. His draft reflects clauses on a goal of the mineral sector's transparency, its frame; principles; a structure, authority and management of the body to ensure transparency of mineral sector and their roles. Moreover, it regulates the relations in reports on transparency, the legal subject in charge of issuing the reports, its rights and duties and the responsibilities to be imposed upon the law breaches, he explained. Ulaanbaatar, October 13 (MONTSAME) An advisor to the President on civil participation and economic policy L.Dashdorj Monday submitted to the Speaker Z.Enkhbold a draft law initiated by the President on "Wealth fund or heritage for future" and related to it bills. In case the bill on wealth fund is adopted, a current management system of the macro economy of Mongolia will be changed, therefore a new system will be formed in the economic management, Mongolia will have its own money accumulation from mineral wealth, devoted to next generations, and stable conditions will be created for Mongolia's economy, said Dashdorj. He went on that a specific part of the revenue from mineral industry will be accumulated to form a financial heritage for the future. Moreover, a system will appear to run a correct management for this fund. In accordance with international experiences, the wealth fund will work as an independent corporation. A system of the Fund for Future is a next phase of the current Human Development Fund (HDF), Dashdorj said. The mining revenue to the HDF will start transmitting to the wealth fund from January 1 of 2018. Ulaanbaatar, October 13 (MONTSAME) Cabinet member and the Minister of Road and Transportation A.Gansukh presented October 10 a bill on joining International Convention on Salvage (1998) and International Labour Organization Convention (2006) to the Speaker Z.Enkhbold. The International Convention on Salvage, adopted in London by the International Maritime Organization, is the first official document to regulate the assignment of rights to captains and owners of ships to sign agreements on operations for salvage of ships, carriages and other assets. The convention aims at eliminating the barriers on establishing agreements on above matters included in domestic regulations, thus, at promoting the punctual rescue operations, and developing the universal rules for improving rescuers' conditions. The Maritime Labour Convention (MLC) is an International Labour Organization convention, established on its meeting between 7 and 23 of February of 2006 as the fourth pillar of international maritime law and embodies "all up-to-date standards of existing international maritime labour Conventions and Recommendations, as well as the fundamental principles to be found in other international labour Conventions". Ulaanbaatar, October 15 (MONTSAME) The founder of Transparency International Peter Eigen called October 14 a press conference at the Kharkhorin Hall of Ulaanbaatar Hotel. He is visiting Mongolia at invitation of Friedrich Ebert Foundation of Germany. Mr Eigen brought a presentation themed "Roles of independent and civil organizations in investigating and combating corruption" into discussion. During the conference, he informed the gathered about solution to corruption—an urgent problem faced by the global political sphere, and about his talks with other countries. Branches of Transparency International NGO have opened in 110 underdeveloped countries. The branches cooperate with press and media organizations to run its activities. Mongolia branch also runs surveys and makes conclusions regarding corruption. The founder of the NGO shared opinions on Tuesday with Mongolia's related officials on Forms and consequences of corruption in mining sector, and on strengthening good governance through combating corruption in the raw materials industry. The Government of Germany has awarded Peter Eigen a state order called "Great Christ Order of Honor", in high recognition of his efforts in combating corruption on an international level. Ulaanbaatar, October 15 (MONTSAME) The parliamentary Standing committee on security and foreign policy ran afternoon session on Tuesday and considered draft amendments to two important documents. They were the Mongolia-Russia intergovernmental agreements on activities of the Mongolia-Russia joint Erdenet Mining Corporation and of the Mongolia-Russian joint "MongolRosTsvetmet" venture, presented by the government. The draft offer new arrangements such as changes in a shareholder from Russian side, and regulations on accumulating the dividends from the companies' activities. In specific, the amendments, offered to these agreements--international by their character and made in July 1 of 2003 and in April 25 of 2007--say about withdrawing the rights of accumulation of Russia's share from a Ministry of state property to the Federal Government or accredited by it representative. The drafts were introduced by the Minister of Industry and Agriculture Sh.Tuvdendorj MP. The gathered asked him some questions and voted by majority for permitting our government to sign and approve these drafts. Ulaanbaatar, October 16 (MONTSAME) A president of the Committee for Mineral Reserves International Reporting Standards (CRIRSCO) T.Edmund together with a president of Geology and Mining Institute of Mongolia D.Damba inked October 15 a document on registering Mongolia in the CRIRSCO as its eighth member. They also approved a request to appoint executive director of the Mongolian Institute B.Oyungerel and a consultant of the Ministry of Mining D.Bat-Erdene as representatives of Mongolia to the Committee. CRIRSCO is an international organization established in 1994 in objective to coordinate activities of international standardization committees that report estimation of mineral resources. Ulaanbaatar, October 14 (MONTSAME) Achit Ikht LLC opened on October 11 the biggest Hydro-metallurgic plant in Mongolia. This plant is capable of producing 10,000 tonnes of LME (London Metal Exchange) – A grade cathodal copper a year. The capacity is estimated to be four times bigger than that of the Mongolian-American joint Erdmin plant. The pilot processes of the new plant have been running since July, after three years of construction of USD 59 million. The plant is processing lower content ore (0.32 percent copper) of Erdenet plant, and producing copper cathodes with 99.9 percent of copper content. The exports are already underway. ULAN BATOR, Oct. 16 (Xinhua) -- Mongolia and Russia have agreed to cooperate to construct a highway that would connect Russia and China through Mongolian territory. The memorandum of cooperation was reached at the 18th meeting of Mongolia-Russia intergovernmental commission, which was focused on bilateral trade and economic cooperation and concluded on Wednesday. The highway is expected to run from Mongolia's northern border district of Altanbulag through the capital of Ulan Bator to the country's southern border town of Zamyn-Uud. The Mongolian government expects the project to draw more foreign direct investment and boost infrastructure construction throughout the country. October 13 (infomongolia.com) Under the auspices of the Prime Minister, International Conference on Investment in Western Region of Mongolia will take place in Khovd Aimag on October 22-24, 2014. The Conference will focus on investment environment, projects and programs introductions in five western Aimags of Mongolia, and in the scope of general plan, it aims to introduce development strategy until 2025, to promote investment projects and programs to carry out, as well as to increase the participation of representatives from investors, policy & decision-makers and civil society representatives in the development activities of mining, infrastructure, industry, agriculture, construction and urban development sectors. 2. 4 Tourism, Services and Social Sector Projects (tourism industry projects, public sector projects, and trade and service sector projects). Also, entrepreneurs' workshop and "Khovd Partnership 2014" trade fair will be organized during the event. Moreover, the International Conference will bring not only national domestic companies, investment banks and funds, but also entities from China and Russia bordering with western Aimags and businesses and individuals from South Korea, Germany and Japan are claimed to participate, say officials. October 16 (MIBG) Canrim Resources is one of the newest companies to break into Mongolia's junior exploration space, but unlike much of the competition, Canrim's founders and it's management have been successfully completing transactions in Mongolia since 2001. Canrim is a private Singapore-based company and looks to help bring Singapore closer to Mongolia with regards to resource investment. With combined management experience of nearly 50 years in the minerals industry and in frontier market environments, Canrim's stated objective is to become the pre-eminent junior exploration and minerals operator in the new era of Mongolia's mining environment. Given recent changes to Mongolia's mining legislation, there has been a renewed interest in exploration. Canrim and others are looking to take advantage of the new ground being made available for exploration by the Mineral and Resources Authority of Mongolia (MRAM). With their geological team currently reviewing a number of sites for possible acquisition through either direct application or tender under the new and revised system, Canrim has also said that they will be evaluating current licenses, held by companies who are faced with funding constraints. Given the current market conditions, Canrim management expects that they will be able to obtain attractive assets at discounted valuations, leading to increased shareholder value. MIBG is a strong advocate for this model, given the current market conditions and opportunities. In recent interviews and reports we have stated that the acquisition of depressed assets in Mongolia will provide the foundation for the next bull market. We believe that the entry of Canrim and similar companies, spurred by positive legislative changes, is the inflection point signifying this new direction in the economy. In Canrim's drive to become one of Mongolia's top junior exploration company's, they are doing all that they can to separate themselves from the competition. To date, Canrim has established a strategic alliance with Mongolia's first geological consultancy, Mine Info Ltd., who possesses one of the largest geological mapping databases in the country. Similarly, Canrim is positioning its capital structure to provide future strength through the participation of strategic individual and institutional investors. Combined with a successful track record of profitably exiting investments in Mongolia, we believe that Canrim's management is positioning the firm for success. Ulaanbaatar, October 14 (MONTSAME) The Development Bank of Mongolia (DBM) is financing 23 packages of projects costing MNT 2.5 trillion in the spheres of energy, construction, housing, auto roads, infrastructure and light industry. For the time being, one trillion and 67 billion Togrog already has been exploited, said N.Monkhbat, an executive director of the DBM at the "Hours of great construction" weekly meeting on Monday. Energy supply of the city has improved, the cost of energy production has declined thanks to expanding the #3 and #4 power plants, building a new "Amgalan" thermal power station (Mogi: not a power station, just a thermal plant to heat east UB), and making a technological reform in the "Baganuur" state-run company. Such big works have not been performed in the last 25 years, he underlined. The DBM is investing 1.8 trillion Togrog in the city's housing and infrastructure, a financing of 590 billion has been made so far together with implementing of projects on restoring a factory of construction productions and building apartments in "Yaarmag" area. In addition, he went on, a financing is being made for the "Buyant-Ukhaa" and the 7th micro-district, a 1,152-flat apartment town near the "Yaarmag" bridge, the "New Yaarmag" micro-district, creating fundamental engineering infrastructure in seven areas, and constructing apartments in "ger" areas. In frames of the "Street" project, financed by the DBM, 20 cross roads have been expanded, 15 new roads have been put into use, feasibility studies for two highways across the city have been completed, so a secondary financing has been given for the engineering design for the highway along the Tuul River, he said. Main part of the investments from the DBM for supporting industries in the capital city has been devoted to financing of 888 selected projects on import substitution. For instance, 39 billion Togrog has been given to 116 projects on small- and middle-sized productions, 140 billion--to 110 enterprises of the agriculture and light industrial sectors, and 90 billion--to 85 projects on backing the export, the DBM said. There are no obstacles in receiving this financing, Monkhbat emphasized. October 15 (infomongolia.com) The Ministry of Industry and Agriculture in collaboration with Mongolian Wool and Cashmere Association, Mongolian Association for Manufacturers of Leather and Skins, and Misheel Group LLC are organizing the "Wool, Cashmere, Hide and Leather Products 2014" annual exhibition and trade fair in Ulaanbaatar on October 16-20, 2014. The event will take place at Misheel Expo Center for the consecutive 8th year and this time over 120 entities industrialized in this sector will be participating and displaying their best products in the following categories. Ulaanbaatar, October 14 (MONTSAME) The Mongolian sailors trained in the Institute of Maritime and Fisheries of South Korea will be working in Mongolia-S.Korean joint sea transport company to transport mineral products of Mongolia, starting from this November. Mongolia joined the International Maritime Organization in 1996, since then has ratified 23 Conventions and additional documents adopted by the organization. The Minister of Road and Transport of Mongolia A.Gansukh presented a bill on joining Maritime Labour Convention (2006) and International convention on Salvage (1989) to the Speaker on October 13. The Ministry sent ten trainees to the S.Korean Institute of Maritime and Fisheries for two years of training of sailorship, which is to complete this year. The fees for trainings and practices have been funded by Busan Technological Institute for Maritime and Fisheries. The Mongolian graduates will practice maritime transport while working on a ship to carry Mongolian mineral products, transported by Russian Trans-Siberian railroads, to a sea through Rajin-Sonbong of North Korea. S.Korean thermal stations and power companies express their interests in receiving coal from Mongolia. Ulaanbaatar, October 15 (MONTSAME) In third quarter of this year, 110.4 thousand entities were registered in the Registry Base of Economic Entities, 56.1 thousand or 50.8 percent of registered are operating. Most of the operating entities are located in Ulaanbaatar, according to the National Statistics Office. Some 34 thousand entities operate in Ulaanbaatar that make up 61.6 percent of all operating organizations, 7.1 thousand or 12.6 percent – in central region, 6.4 thousand or 11.5 percent – in region of Khangai, 5.7 thousand or 10.2 percent – in western region, and 2.3 thousand or 4.2 percent in eastern region. Entities with one to nine workers cover 84.9 percent of all operating entities, 10-19 workers – 6.5 percent, 20-49 workers – 5.3 percent, and entities that have more than 50 workers make up 3.2 percent. Among the non-operating 54.3 entities registered in the base include 16.6 thousand that have not started operations - 30.5 percent, 30.7 thousand or 56.5 percent – temporarily stopped operations, one thousand or 1.9 percent – entirely shutdown, 6.0 thousand or 11.1 percent – without specific address or with other reasons. Ulaanbaatar, October 16 (MONTSAME) According to a report from the National Statistics Committee, 1, 344.4 thousand tons of wheat crop, 145.7 thousand tons of potatoes, 81.4 thousand tons of vegetables, 1,022.4 thousand tons of haylage have been harvested by October of this year, and 21.2 thousand tons of forage were prepared this fall. The numbers show decrease of 67.7% or 139.0 thousand tons in wheat crop, 10.7% or 98.6 thousand tons in haylage; and an increase of 2.2% or 451.0 thousand tons of forage; and decreases of 10.0% or 16.3 thousand tons in potato, and 7.8% or 16.9 thousand tons in vegetables. Ulaanbaatar, October 15 (MONTSAME) The fourth consultation of energy control experts was held Tuesday in Ulaanbaatar. Co-organized by the Ministry of Energy, the General Agency for Specialized Inspection (GASI) and the #2 thermal power station, the consultation attracted D.Dorjpurev, the Vice Minister of Energy; L.Batsaikhan, head of the State Management Department of the Energy Ministry; and D.Jargal, a department head of the GASI; also 54 engineers and technical experts from 25 organizations. Eight reports were delivered at the consultation. The participants decided to issue a recommendation and to send it to energy companies and factories. Next consultation will be run in 2015 by the "Dorgon hydropower station" LLC at the "Energy system of western region" state-run company. Ulaanbaatar, October 15 (MONTSAME) The 5th meeting of Human Resources (HR) managers will be held at the Great Hall of the Mongolian National Chamber of Commerce and Industry on October 16. It will be co-organized by the National Research Institute of Human Resources together with the Mongolian National Chamber of Commerce and Industry. The main topics are organization development, human factors, and managerial skills. The participants will learn methods of HR management and planning and global trends in this sector. October 14 (The Hollywood Reporter) The 'X-Factor' creator and judge was feted for his "visionary flare" in changing the music and TV industries. If you think the deepest thing about Simon Cowell is his signature v-necks, a different man accepted MIPCOM's Personality of the Year award Tuesday night in Cannes. Cowell noted that during yesterday's keynote speech X-Factor formats lit up most of the world map, with Mongolia being the most glaring exemption. "For some reason it just pissed me off," he said of the blank spot, adding that Mongolia bought the format today. October 15 (TVBEurope) Mongolian broadcaster, Mongol TV, has upgraded the PlayBox Technology system at its HQ in the country's capital. New playout servers and integrated software were installed by engineering staff from the PlayBox Technology Asia Pacific office in Kuala Lumpur, Malaysia. The PlayBox Technology AirBox content playout and streaming system is designed for 24/7 unattended operation, and can be connected to third-party devices. AirBox supports MPEG1/2/H.264, HDV and DV streams from most production platforms capable of providing AVI, MPEG, MXF, QuickTime or WMV content. A new feature integrated into the system at Mongol TV is AirBox MPO (Multi Parallel Output) which can be used to deliver HD-SDI, SD-SDI (with realtime rescaling) and IP streaming, or (for example) output H.264 (MPEG-4) plus MPEG-2 at the same time. "Two AirBox servers in main and redundant configuration have been performing successfully at Mongol TV right from the network's commencement in 2008," said Iulian Ionescu, regional sales director at PlayBox Technology APAC. "These have been replaced with the latest versions which provide extra features such as automatic control over the on-air playlist. This is particularly appreciated by the station's staff as it reduces the level of human intervention required. "The system integrated into Mongol TV also includes PlayBox Technology Back-Up Manager which performs automatic switchover in the event of any failure in the primary server. The AirBox servers cache content from a large external server. The system is housed in the technical area and drives a newly-installed router." October 16 (infomongolia.com) On October 16, 2014, an official ceremony of accrediting new Chairman of Ulaanbaatar City Police Department as Police Colonel Choijantsan BOLDBAATAR was held at the Citizens Hall of UB Administration, where Mayor E.Bat-Uul, Deputy Chief of National Police D.Erdenebaatar, Director of Capital City Administration Yo.Gerelchuluun and other officials were present. According to the latter amendments on the Law of Police Service, the Capital City Police Department was renamed as the Ulaanbaatar City Police Department and in conjunction; it was decided to appoint new Chairman of UB Police by joint communique of Mayor and Chief of National Police. After which, the UB Mayor and National Police Chief have issued a joint ordinance to organize selection process of new Chairman for Ulaanbaatar City Police Department and in the scope of procedure, the Capital City for the first time elected its Police Chairman open to public. In this election, six nominees had sent its candidacies, whereas each developed an action plan to implement in 2015 and in the final stage, two candidates were left, where Police Colonel Ch.Boldbaatar collecting a total of 81.8 points becomes new Chairman of UB Police. October 15 (The Asia Foundation) Almost 60 percent of the population of Mongolia's sprawling capital, Ulaanbaatar, lives in informal settlements, known as ger areas. In 1989, 26.8 percent of Mongolia's population lived in Ulaanbaatar; by 2006 that number had risen to 38.1 percent; and by the 2010 census, 45 percent of Mongolia's population lived in the capital. Looking forward, population growth in the capital city is expected to continue at the same pace. Such rapid growth has severely challenged the city's ability to deliver quality services such as solid waste management and public transportation to residents – particularly since the majority of these ger areas are unplanned settlements. Compounding this challenge is that the city government lacks reliable data on many of these expanding urban areas, and this lack of data – including road conditions and accurate topographic measurements – has contributed to insufficient service delivery. As cities like Ulaanbaatar grow more complex and dynamic, so do the challenges of managing a city's economic, social, and structural development. Cities have always needed sound data to make smart policy decisions. New, faster, and lower-cost tools are now making it easier to collect large volumes of useful data. Data collected using remote sensing technologies such as imaging satellites and aircraft is increasingly used in development contexts. Collecting and analyzing high-quality satellite and aerial imagery is becoming more efficient and more affordable, making it easier to keep street maps current, to identify watersheds and drainage networks, and to generate land classification and topographic maps. These technologies can establish a baseline framework to help cities prepare for and respond to disasters, provide access to critical social services, and manage urban development. Sensing technologies can provide this imagery and help make it possible for city residents and local leaders to navigate rapid change and work together to solve increasingly difficult development challenges. To plan for Ulaanbaatar's continued growth and to deliver these vital urban services, city officials need accurate and up-to-date interactive maps. To advocate for a higher quality of living in their neighborhoods, ger area residents also need reliable and accessible maps. Building upon our existing community mapping project (read more about this project), The Asia Foundation is partnering with the City Municipality of Ulaanbaatar to use aerial imagery and open source tools and services like OpenStreetMap (OSM) – a free, online "Wikipedia-like" map of the world created by 1.6 million contributors – to develop a more complete and accurate online, open, and free map of Ulaanbaatar. This approach will enable citizens to actively engage in documenting where infrastructure is changing: it can capture activities such as new construction and demolition of buildings, paved and unpaved roads, hospitals and schools opened, and bus stops established. And the City Municipality can subsequently use this information to help inform urban planning and policy-making, much like New York City and other cities are doing. DigitalGlobe, a leading provider of global commercial Earth imagery and geospatial information, recently granted The Asia Foundation high-resolution satellite imagery for tracing in OSM. The new imagery is more recent and of higher quality than anything previously available to OSM editors, who will use it as a guide: adding roads, buildings, rivers, railways, and other features to OSM's map of Ulaanbaatar. Mapbox, which provides a powerful and diverse platform for the creation of custom online maps, has processed the raw satellite imagery to prepare it for use in OSM and is hosting the resulting map tiles. In the coming months, we'll also be introducing even more high-resolution imagery of priority ger areas in Ulaanbaatar that we captured using unmanned aerial vehicles (UAVs). Stay tuned for more on this. The aim of the mapping project is to provide urban planners and citizens with reliable, complete, and up-to-date data to make more informed decisions, and ultimately improve urban planning and urban service delivery, particularly for Ulaanbaatar's ger areas. With the City Municipality of Ulaanbaatar, The Asia Foundation will be hosting a map "edit-a-thon" in Ulaanbaatar on Saturday, October 25 at 10 am. The event is open to experienced map editors and newcomers who want to learn how to map in OpenStreetMap. Check back here for location information. New to OpenStreetMap? Learn more about how to use and contribute. If you're already familiar with OSM, just follow these simple instructions to start mapping Ulaanbaatar. 1. Go to www.openstreetmap.org and login to your account. 3. Start tracing, and watch the changes take shape in real time! Michelle Chang is ICT manager and Tomas Apodaca is Data and Application specialist, both for The Asia Foundation's Digital Media and Technology Programs unit in San Francisco. The views and opinions expressed here are those of the individual authors and not those of The Asia Foundation. They can be reached at michelle.chang@asiafoundation.org andtomas.apodaca@asiafoundation.org. October 14 (infomongolia.com) Celebrating the 375th anniversary of the Capital City, the Ulaanbaatar Administration for the first time to host a parade named after the Mayor of UB at Chinggis Square on Wednesday, October 29, 2014. At this parade about 8,000 participants from over 30 organizations including governmental, NGOs and universities are registered to attend and during the event, many activities will be organized such as food taste, city big sale, art and cultural performances. Also, as part of collaborations, Tengis and Urgoo cinemas will feature all movies at 50% of discounts on this day and the city museums will be opened with free entrances including Mongolian National Museum, Choijin Lama Temple Museum, Winter Palace of the Bogd Khaan, Zanabazar Museum of Fine Arts, Mongolian National Modern Art Gallery, Mongolian Theatre Museum and UB Museum. Moreover, the city public transportation will also serve at half-price ticket. October 14 (Two Shoes and a Backpack, Yahoo News Malaysia) The capital of Mongolia, Ulaanbaatar, is a dusty, chaotic city within driving distance of the country's endless steppes. This is the country's financial and business centre, making it the largest settlement with a semblance of permanence in a land inhabited by nomads. Ulaanbaatar has its own attractions, but the true beauty of Mongolia lies in the countryside. Those who visit Mongolia do so for the sweeping landscapes, not for the cities. The good thing about Ulaanbaatar is that you won't have to go far to escape its traffic-choked streets and potholes. Mongolians are nomadic by nature, so even their towns aren't completely permanent. As you drive away from the centre of Ulaanbaatar and into the outskirts, you'll notice more tents than buildings. Outside the centre, families tend to live in large tents called yurt so that they can pack up their belongings and move anytime they want. A visit to Ulaanbaatar will be a combination of exploring the city's attractions as well as trips into the countryside. Here are my recommendations for things to do in the Mongolian capital. Travelling in Mongolia can be very challenging due to road conditions in developed areas as well as in the countryside. Vehicles, including those belonging to travel agents aren't always in the best condition, so be prepared for delays and breakdowns. Finally, a lot of things in Mongolia depend on factors beyond human control, like the weather. Even livestock and horses can wander off. In short, be flexible with Mongolia and don't rush through. October 16 (infomongolia.com) On September 03, 2014, the Governments of Mongolia and the Russian Federation have established a series of intergovernmental documents at the Government House in Ulaanbaatar. One of the documents inked was an Intergovernmental Agreement on reciprocal visa-free travel between citizens of the two countries and today on October 16, 2014, the Ministry of Foreign Affairs of Mongolia announced that the Agreement effectiveness enter into force from November 14, 2014. In the scope of the Agreement on reciprocal visa-free travel, nationals of the two countries will be eligible to travel up to 30 days, but not to exceed 90 days in any 180 day-period. For a stay of more than 30 days, a traveler must apply for an appropriate visa. October 16 (infomongolia.com) The XVIII Intergovernmental Committee meeting on Trade, Economy, Science and Technical Cooperation between the Governments of the Russian Federation and Mongolia was successfully finished in Ulaanbaatar on October 15, 2014. The main purposes of this annual meeting were to foster bilateral relations, in particular, as a result of negotiations reached during the Russian President Vladimir Putin's visit to Mongolia held last month and to provide further impetus to the development of mutually beneficial cooperation in trade and economy of the two countries. During the meeting, parties exchanged opinions on opportunities to solve problems in Mongolian-Russian trade and economic cooperation, and measures to carry out. Moreover, the topics focused were on operational efficiency in joint ventures of Erdenet Mining Corporation, MongolRosTsvetMet LLC and Ulaanbaatar Railway (UBTZ), besides to broaden partnership in intensifying bilateral trade, infrastructure, mining, construction and humanitarian spheres. However, the strategic partnership between our two countries has been developing sustainably in all sectors in recent years, but the trade volume shows decline this year, for instance, the trade turnover decreased by 15.8 % and reached 1.6 billion USD in 2013. Therefore, by re-opening Russian Trade Representative Office in Ulaanbaatar would significantly impact to the development of bilateral trade and economic relations, stressed the Russian side. The XVIII Intergovernmental Committee was chaired by Deputy Prime Minister of Mongolia and Head of the Mongolian part of the Mongolia-Russia Intergovernmental Committee Dendev TERBISHDAGVA representing the Government of Mongolia and the other side by the Minister of Natural Resources and Environment of the Russian Federation, the Head of Russian part of the Russia-Mongolia Intergovernmental Committee Sergey Yefimovich Donskoy. Following the intergovernmental meeting, the heads of Committee have established a Protocol on issues negotiated during the meeting and tasks to implement. Moreover, "Chinggis Land Development Group" LLC and Russian "DalStroyMekhanizatsiya" JSC have signed a Memorandum of Understanding to jointly implement "Altanbulag – Ulaanbaatar – Zamyn-Uud Highway" Project. At the XVII Intergovernmental Committee meeting held in Moscow in November 2013, 47 issues were discussed, whereas 13 have been implemented completely, 30 undergoing and 4 have not discussed yet so far, parties noted. October 14 (infomongolia.com) On October 13, 2014, the President of Mongolia Ts.Elbegdorj left the country to attend the 10th ASEM Summit in Milan, Italy and during a short stay in Moscow before to head for Europe, President Ts.Elbegdorj visited the site of ITAR TASS, Russian News Agency, where he held a meeting with members of the Club of Chief Editors of the Russian Mass Media. During the meeting with Russian Chief Editors, President Ts.Elbegdorj stressed the importance of the September visit of Russian President Vladimir Putin to Mongolia and shared on perspectives of the development of cooperation between Russia, Mongolia and China. After which, President Ts.Elbegdorj, the honored guest of the Club was handed a film dedicated to him as part of the series of "Formula of Power", a TV series that profiles world leaders, hosts by ITAR-TASS First Deputy Director General Mikhail Gusman. Moreover, Mr. Gusman had a chance to hold an exclusive interview with President Ts.Elbegdorj. This is the second interview with Mongolian President and the first interview was made when Mikhail Gusman visited Ulaanbaatar as one of the President's Guests to witness the 2014 National Naadam Festival and timely before the Russian President V.Putin's working visit to Mongolia paid last September. In the latter exclusive interview with Mikhail Gusman, President Ts.Elbegdorj said, "We want to keep developing partnership with Russia and as of fact, when we ask our people which country they want to have closer relations with, statistics show 60% prefer Russia and 15-20% choose China. The rest of the world is our third neighbor. Of course, we want to have good relations with all other countries. It's good for our neighbors too, because there appear more opportunities for investment". In addition, President Ts.Elbegdorj noted, "When someone somewhere asks whether an American military base may appear on Mongolian territory, I can say, it will never happen, because Mongolia's Constitution bans deployment of foreign military bases on the country's territory". October 14 (President.mn) Today, President of Mongolia Tsakhiagiin Elbegdorj and accompanying delegation arrived in the Republic of Austria for an official visit. President of Mongolia was officially welcomed by Heinz Fischer, the Federal President of Austria at the Innerer Burghof Square of the Hofburg Palace. Chief of Staff of the Office of the Federal President of Austria Politzer Helmut, Vice Chancellor and Federal Minister of Economy, Science, Family and Youth Reinhold Mitterlehner and the Ambassador Extraordinary and Plenipotentiary of Austria to Mongolia Ms. Irene Giner-Reichl were present at the welcoming ceremony. After posing for photo, President of Mongolia Ts.Elbegdorj and the Federal President of Austria Heinz Fischer held bilateral meeting. During the two-day visit to Austria, President Elbegdorj is scheduled meet with the President of the National Council of Austria Ms. Doris Bures, visit the United Nations Office in Vienna and open Mongolia-Austria Business Forum. It is expected that the official visit of the President Elbegdorj will play pivotal role in enhancing bilateral relations between Mongolia and Austria, particularly, in expanding economic, trade, investment cooperation and intensifying mutual partnership within the international organizations. ULAN BATOR, Oct. 16 (Xinhua) -- Mongolia and China have continuously advanced relations and strengthened cooperation in various fields since the establishment of diplomatic ties 65 years ago, Prime Minister Norov Altankhuyag said Thursday. "Mongolia is one of the first countries that established diplomatic relations with new China," Altankhuyag said at a reception held by the Foreign Ministry to celebrate the anniversary of diplomatic relations. He expressed satisfaction with the upgrade of bilateral relations to a comprehensive strategic partnership. "According to the fundamental documents of traditional friendly relations and cooperation, our two countries mutually respect their independence, sovereignty and territorial integrity, and resolutely adhere to the principles of equality, mutual benefit and peaceful coexistence, as well as of mutual respect of the development paths they have chosen," he said. Altankhuyag added that China's commitment to exchanging development experience has contributed not only to Mongolia-China relations, but also to regional cooperation. This year marks the 65th anniversary of diplomatic relations between Mongolia and China, as well as the 20th anniversary of the signing of an agreement on friendly relations and cooperation. With the aim of celebrating the anniversaries, both sides have announced this year as the "Year of China-Mongolia Friendly Exchanges," and will co-organize a series of events, including high-level mutual visits, photo exhibitions, cultural programs and youth exchange projects. October 15 (infomongolia.com) The first meeting between defense sectors of Mongolia and the United Kingdom of Great Britain and Northern Ireland was held in Ulaanbaatar on October 13, 2014. The British side was represented by Brigadier General Simon Levey, Defense Attache at British Embassy in Beijing, China, who concurrently serves as Defense Attache to Mongolia and Julian Pearson, Deputy Head of Mission and Head of Commerce at British Embassy in Ulaanbaatar, where the Defense Ministry of Mongolia by Colonel D.Ariunbold, Director of the Department for External Cooperation. During the meeting, parties exchanged views on bilateral relations within defense sector, current state of partnership and its further tendencies, and agreed on the measures to implement jointly in 2015. At the meeting it was also discussed and agreed to continue training of Mongolian military staff at the UK Military School, to expand participation of the UK representatives at the Khaan Quest multinational peacekeeping exercise, to continue the implementation of "Peacekeeping English" project at Defense Ministry of Mongolia, to exchange of experiences in the military hospital and back-office management services as well as to develop horse polo sport in Mongolian defense sector. This meeting was significant as the first official talks since the establishment of Memorandum of Understanding between the two Defense Ministries inked in 2012. October 14 (infomongolia.com) On October 14, 2014, Minister for Foreign Affairs of Mongolia L.Bold received in his office the U.S. senior military leaders visiting Mongolia under the Capstone Military Leadership Program. During the meeting, Minister L.Bold informed the foreign policy of Mongolia and the current state of the Mongolia-U.S. relations and cooperation and touched upon some issues concerning bilateral cooperation in the defense field. Also, presenting Mongolia's position towards international and Northeast Asian regional issues, Minister L.Bold answered the questions of the Capstone fellows, who visited Mongolia several times under this Program. CAPSTONE is a joint service professional military education courses for newly promoted brigadier generals and rear admirals serving in the United States military. The National Defense University conducts the CAPSTONE course with objective to ensure senior military leaders understand how military forces and other elements of national power are integrated and used to support national military strategies, and how joint, interagency, and multinational operations support strategic national objectives. Ulaanbaatar, October 16 (MONTSAME) The State Secretary of the Ministry of Defense Major-General Z.Boldbaatar received on Wednesday 15 Generals and other high military officials from the USA. The delegation is here thanks to the National defense university of the USA that provides short-term trainings for the newly appointed Generals and send them for internships in their specialized fields. The State secretary thanked the guests for arriving here to get au fait with Mongolia's defense sector and expressed a satisfaction with a development of the bilateral relations between the two countries, noting his willingness to expand the ties in concrete fields. A head of the delegation General Martin appreciated a hospitality and said that they had learned a lot and that "is an honor to serve together with the Mongolians in the global combat against terrorism". The US Generals also visited Ministry of foreign affairs, National security council and Institute for strategic studies and a Military training centre at Tavan Tolgoi. Ulaanbaatar, October 16 (MONTSAME) Department for Peacekeeping operations of the UN made a decision on September 26 to appoint Brigadier General and head of the department of policy planning in the Ministry of Defense of Mongolia Mr D.Bayarsaikhan as the Regional commander for Northern International troops. He is to leave Mongolia October 19 to receive his office at the location. In high recognition of this historic event for Mongolia's defense and Armed forces, the Defense Ministry paid tribute on Wednesday to D.Bayarsaikhan and handed him a gift. In accordance with the resolution, enacted this year by the UN Security Council, a number of military personnel for the UNMISS (the UN Mission in South Sudan) operations, underway since 2011, has been increased from 6,500 to 12,500. The PRC, Ghana, Bhutan and Ethiopia has sent moto vehicle sections with 850 military personnel for each to South Sudan, pursuing the resolution. The UNMISS operations troops have been structured into several regional commands, where the Mongolian military men are serving as well. The UN has increased the number of international personnel serving duties in the spot, an invitation for which has been sent here. Following it, our generals were examined and interviewed accordingly and they have passed all requirements. It is apparent that our military personnel can operate in leading positions of such operations. About his mission in South Sudan, Brigadier-General D.Bayarsaikhan said that "regional commander for northern troops commands four battalions from Mongolia, India, Ethiopia and Ghana". Our General is one of eight Generals to be in command of the UNMISS. He said the location he is responsible for is the main oil-field of Sudan. This location is vulnerable in terms of current condition as some ten thousand has been killed during a civil-war-like conflict and hunger and contagious diseases have taken over. According to unofficial source, the Government of Sudan will be take decisive measures against the opposition, and "I will be commanding 4,200 troops, including four moto vehicle battalions from Mongolia, India, Ghana and Rhuanda, and a section from Ethiopia", said the General. Ulaanbaatar, October 13 (MONTSAME) It was said by M.Batchimeg MP on Monday at her meeting with a delegation led by Alexey Lyzhenkov, a director of the Department of trans-boundary threats of the Organization for Security and Co-operation in Europe (OSCE). Mr Lyzhenkov, visiting Mongolia these days at invitation of Mongolia's University of Law Enforcement, said he is satisfied with being here. Earlier this year, Batchimeg MP had met with Mr Lyzhenkov and Mr Lamberto Zannier, the OSCE Secretary-General, during a meeting of the OSCE Parliamentary Assembly in Vienna, Austria, to share views on expanding the Mongolia-OSCE cooperation in concrete directions and on a proposal on establishing a regional cooperation center in Mongolia. Here Lyzhenkov appreciated actions of the university and stressed that it is possible to found a regional research center at the university and to make it a bridge to connect the OSCE with European and Asian partner-countries. Expressing a satisfaction with meeting Mr Lyzhenkov again, Ms Batchimeg said she is happy with making first steps to realization of matters discussed at the previous meeting. Mr Lyzhenkov invited Ms Batchimeg to give a report on security and reforms of law enforcement area at the OSCE Headquarters in Vienna. After this, the sides concurred to issue a plan for implementing the above matters. October 16 (Inside World Football) Asian football has been rocked by yet another scandal, with the fallout from former AFC president Mohamed bin Hammam's disgraced legacy snaring another culprit. One of the region's most senior figures, Mongolian FA president Ganbold Buyannemekh (pictured), has been banned for five years by FIFA for "soliciting and accepting payments" linked to one of the most damaging corruption scandals to hit the governing body. FIFA's ethics committee found that Buyannemekh, a former member of the AFC's executive committee, received money in 2009 linked to bin Hammam's election to the FIFA executive committee - when he narrowly beat current AFC chief Sheikh Salman bin Ebrahim al-Khalifa - and then linked to the FIFA presidential election two years later. The ban comes at an awkward time for the AFC hierarchy ahead of fresh elections next year and amid constant assurances that the region is cleaning up its act off the field. "The adjudicatory chamber of the FIFA ethics committee, chaired by Hans-Joachim Eckert, has decided to ban the president of the Mongolian Football Federation, Ganbold Buyannemekh, from taking part in any kind of football-related activity at national and international level for a period of five years," a FIFA statement said. "Mr Buyannemekh solicited and accepted payments [from Mr Mohamed bin Hammam] in the context of the elections for the FIFA executive committee at the AFC Congress in 2009 as well as the FIFA presidential election in 2011." Bin Hammam, former head of the Asian Football Confederation, withdrew his bid to challenge Sepp Blatter for the FIFA presidency in 2011 just days before the election to fight bribery allegations regarding payments to Caribbean members. The Qatari, who has always denied wrongdoing, subsequently had a lifetime ban lifted on appeal but resigned from all football-related posts in 2012 and received a second lifetime ban, this time for "conflicts of interest" linked to misuse of AFC funds. The 50th anniversary of Mongolia's first appearance at a Summer Olympic Games has been celebrated. October 14 (Inside the Games) A team of 35 represented Mongolia at the Tokyo 1964 Games, competing in five sports - athletics, cycling, gymnastics, shooting and wrestling. No medals were won by the country in the Japanese capital, but it signalled the start of a run of appearances at the Summer Games broken only by the boycott at Los Angeles 1984. The anniversary has been marked by the Mongolian National Olympic Committee (NOC) at Olympic House in the capital Ulaanbaatar. NOC President D Zagdsuren and sports vice-Minister M Tumenjargal awarded 16 living Olympic legends, ranging in age from 70 to 88, with International Olympic Committee pins. They then took part in the opening of an "Olympic mini park" in the city's National Park, with 100 trees planted commemorating the nation's Olympians and medallists. Mongolia, a country with a population of around three million, has won two gold medals, seven silver and 15 bronze at the Summer Olympic Games. They came courtesy of judoka Naidangiin Tüvshinbayar and boxer Enkhbatyn Badar-Uugan. October 14 (news.mn) Mongolia, the country with the lowest population density, welcomed the first millionth citizen back in 1962. The two millionth citizen of Mongolia was recognized in July of 1988. According to a study done by the National Statistical Committee Mongolia, the 3 millionth citizen has been welcomed in the first quarter of 2015, a whole 27 years later than the second millionth citizen. Surveys show Mongolia`s population growth rate has been an estimated 1.8-2.0 percent in the past five years. Ulaanbaatar, October 15 (MONTSAME) The Speaker of parliament Z.Enkhbold Wednesday received a delegation headed by Mr Shine Bhaskaran, a president of the Junior Chamber International (JCI). A JCI president for Mongolia S.Sainbat thanked the Speaker for the audience and said the JCI Asia-Pacific regional meeting has been planned in 2017 in Ulaanbaatar and that the JCI wants to get a support from the top legislator. In response, the Speaker Enkhbold wished the JCI successes and said state organizations are ready to help the JCI branch in Mongolia in organizing the above meeting. He also noted that three MPs, who are serving as the JCI senators, may back this meeting too, and requested Mr Bhaskaran to pay more attention to the organization of this meeting. To this Mr Bhaskaran thanked for receiving and spoke about the JCI. Founded in 1944 in Mexico, the JCI is a non-profit international non-governmental organization of young people of 18-40 years. It has members in 80 countries. It has consultative status with the Council of Europe, with the Economic and Social Council of the United Nations and with UNESCO. It encourages young people to become responsible citizens and to participate in efforts towards social and economic development, and international co-operation, good-will and understanding. The NGO publishes JCI World, a quarterly magazine, in six languages. It holds an annual conference, the JCI World Congress, in November of each year, and regional annual meetings, the JCI Area Conferences. The JCI opened its branch in Mongolia in 1992, Mongolia became an official member of the JCI during the 1995 JCI Congress in Glasgow, the United Kingdom. The JCI Mongolia has 12 branches, 600 members and 120 senators. October 16 (infomongolia.com) Organized by Educational Advising and Resource Center (EARC) NGO, the US College Fair 2014 will be taking place at the Education USA Mongolia in the City Central Library named after D.Natsagdorj, Ulaanbaatar on October 17-18, 2014. During the two-day event, promotions for educational opportunities, scholarship information, guidance and assistance for those wishing to study in the United States will be provided as well as lectures and quiz games will be also organized. Moreover, the USA college and university admission officers, EARC consultant and regional directors of Education USA China will be delivering comprehensive information on American educational system such as general understandings on 2-year school program, bachelor's, master's, doctoral and professional training (business, medicine, law) and language courses, besides, admission steps, general requirements and an essay writing methods will be presented during the event. In addition, the US Embassy staff will introduce a student exchange program, scholarships for Mongolian teachers and students visa related issues. October 15 (ADB) Mongolia's traditional ger tents are being used as kindergartens, helping local authorities educate the country's next generation. October 16 (news.mn) Minister of Education and Science of Mongolia L.Gantumur presented President of Nagoya University of Japan Michinari Hamaguchi with the State's Highest Award, the Golden Star. Nagoya University of Japan is in collaboration with a number of Mongolian universities including National University of Mongolia, the Mongolian University of Science and Technology, Mongolian State University of Education and Mongolian National University of Medical Sciences. Nagoya University of Japan has carried out a number of joint research projects and programs in the Mongolian higher education sector during the past two decades contributing great efforts to Mongolia`s education and science sector. Nagoya University of Japan is now leading Japan's universities for Noble Prize winners as two professors from the university won 2014 Noble prize in physics. Nagoya University of Japan is to open a representative office in Mongolia. October 13 (news.mn) Mongolia's Ministry of Environment and Green Development has launched redbook.mn webpage and an e-version of The Red book of Mongolia. The book focuses on taking measures to save and protect endangered species as well as recover their habitat and extend protected areas. Redbook.mn provides data related to endangered species and herbs found in the book. The webpage has launched and the book is available through the iBooks application on iPhone, iPad, Kindle and other electronic devices. It is also accessible on PC. This issue is in alliance with the national campaign "Green Development Concept" organized through the Ministry's Medium Term Program established by the Government of Mongolia 2012-2016. October 16 (news.mn) With initiatives by Mongolian Young Scientists' Association and Ministry of Education and Science a joint annual scientific conference has been organized at Khurel Togoot – 2014 in collaboration with the Science and Technology Foundation and the National Academy of Sciences. The Annual Scientific Conference, Khurel Togoot – 2014 goals are to create opportunities for young scientists to expand their research works, provide support for new generation of scientists, share results of their research, and to promote science in the government, and private and public sectors. Over 500 researchers and scientists gather at the conference including numerous veteran scholars, teachers who have devoted lives for science, and officials of the related departments. At the conference, the top 100 presentations will be selected and 12 young scientists will be awarded 4,000,000 MNT grants for research by the Minister of Education and Science under the decision of a jury panel. A new study suggests the aspirations of women in Mongolia have rapidly shifted. Before the rapid economic transition of the 1990s, the wealthiest women in the Communist-style era had big families. However, women today are less interested in babies and driven more by money and status. October 16 (Oxford University) The research by Oxford University and Sheffield University was based on interviews with 9,000 women in Mongolia, a country that underwent a sudden transition from a Soviet-style state to mass privatisation. While the older cohort who lived under a Communist-style regime were likely to have bigger families if they were wealthier, younger women living in a more capitalist society want wealth and a partner with social standing before starting a family. The research is published in the latest issue of the journal, Proceedings of the Royal Society B. The authors describe this as a 'demographic-economic paradox': the unequal and skills-based society of Mongolia today enables the educated women to rise up the social ladder and make money, but rather than this change being liberating, the paper suggests it seems to be at the expense of high fertility. As the free market takes hold, those women who have children later to pursue education become wealthier and this trend is particularly marked in the cities where most of the opportunities lie. The research investigated the link between women's attitudes towards child-bearing and wealth, both between and within regions. The researchers analysed survey data on 9,000 women, aged from 15-49 years old, and over 4,000 husbands. They were asked about income, household amenities, educational level, the total number of children born, and how many children they already had when they first used contraceptive methods. This effect was found to be three times stronger in urban as compared with remote, rural areas. The paper is one of the few empirical studies to look at how decision-making on reproductive behaviour is shaped by a woman's access to resources and economic opportunity. The paper says a woman's quest for status can depend on context: so whereas household wealth predicts a higher incentive to have children later in life in the urban areas of Mongolia, in Addis Ababa, fertility is highest among the wealthiest as big families carry status for women within that population. In 1999, when Bumochir was a student in Ulaanbaatar, he had an opportunity to attend an academic debate between the philosopher V. Batchuluun and the philologist S. Dulam as to whether Mongolians can be said to have had a civilization or not. The philosopher, Batchuluun, conceived of civilization in terms of the urbanized and institutionalized state, with densely populated settlements, standing in contrast to hunter-gatherer and nomadic pastoral societies. He argued that Mongolians only began building a civilization as such in the mid-twentieth century with the construction of a genuinely urban lifestyle in the Soviet apartment blocks of central Ulaanbaatar. In contrast, Dulam, as a philologist, subscribed to Arnold Toynbee's notion of nomadic pastoralism as an 'arrested civilization'.1 He argued that the concept of civilization must be an inclusive one, applicable to other ways of life such as those of 'nomadic' peoples. Densely populated, sedentary urban life cannot be the sole standard for civilization, in contrast with notions of the 'uncivilized', 'nomadic' and 'barbarian' he argued.2 However, in this special issue, we do not set out to either substantiate or deny the existence of 'Mongolian nomadic civilization' nor are we concerned with trying to say when Mongolia might be said to have acquired such a thing. The articles presented here do not share some essentialist vision of 'civilization' or the sort of sweeping categorization of Huntingdon's Clash of Civilizations.3 They neither propose nor assume criteria for distinguishing more or less civilized formations or persons. We recognize the legacy of evolutionist notions of 'civilization' used by nineteenth-century scholars such as L. H. Morgan's,4 which permitted a reified categorization of human cultures5 and that later permitted the politicized vision of conflict between cultures, nations and blocs that Huntingdon described. Rather, the papers presented in this special issue all touch in some way upon the historical processes by which 'civilization' or associated concepts were constructed. In Mongolian, the term soyol irgenshil, which combined the term used for 'culture' with that used for 'citizenship', literally meaning 'culture-citizenship' in contemporary Mongolian, which came to stand for 'civilization', only appeared linguistically in the second half of the twentieth century. This was a concept imported from Europe and introduced as the translation of the Russian term tsivilizatsiya (цивилизация). The introduction of the term marked the emergence of the claim for civilization made as part of the nation-building process. The origins of the concept of 'nomadic civilization' and the arguments and evidence used to support it are examined in a recent paper by S. Dulam.6 As an independent state, Mongolia was in a position to claim a unique civilization of its own, alongside its powerful neighbors – China, Russia and the Central Asian States. Since the celebration of distinctive civilization is a common feature of the mythology of the nation-state, Mongolia declared its unique heritage by deploying the term 'nomadic' to describe both civilization and culture as part of its inimitable national identity. Since a great deal has already been written in this mode on the content of 'Mongolian nomadic civilization', the contributors to this publication are in a position to examine the process and consequences of this national construction of civilization. In some ways, of course, the Mongolian claim for a nomadic civilization might appear oxymoronic, since the root of the equivalent European terms for civilization is the Latin civis (city-dweller/citizen). So Mongolian claims for the recognition of nomadic civilization has to be seen in relation to evolutionarist and colonial-era discourse that contrasted civilized with uncivilized barbarian society, represented by the 'nomads' as a social type, which gave rise to a specialist scholarship of its own.7 It was in response to this evolutionist urban-centrism, then, that the notion of 'nomadic civilization' was pressed forward, very largely by Mongolian scholars. Many of the papers in this issue share a common interest on how a wide range of resources, from the natural to the cosmological, were discursively reproduced as evidence for civilization through processes of scholarly knowledge production. B. Tsetsentsolmon's paper, for example, provides a detailed examination of how leading Mongol scholars argued against the notion of 'uncultured barbarian nomads' and promoted the term nüüdliin soyol irgenshil – meaning literally 'Nomadic citizenship-culture'. In this political-academic project, they gained important support from UNESCO in the 1970s. In a comparable way, D. Bumochir's paper examines the ways in which scholars from both Mongolia and Inner Mongolia countered the representation of 'shamanism' as a primitive form through the construction of the concepts of böö mörgöl and böögiin shashin referring to 'shamanism' and 'shamanic religion' in order to place it on a more equal footing with the established 'world religions'. The paper notes the continuing relevance of notions of civilization and culture and its manipulation by the state in Inner Mongolia. Nasan Bayar describes Chinese government-sponsored research projects designed to promote the concept of 'Grassland Culture' as one of the three great components of Chinese Civilization, and which has involved the work of Inner Mongolian scholars. But whereas in Mongolia nomadic culture is regarded as the product of an independent civilization of the steppes, in Inner Mongolia, Grassland Culture is but one component of a larger, inclusive category – 'Chinese civilization'. In both cases, the scholarly treatments reflect and are reflected in public and political discourses, as the states set about 'nationalizing civilizational resources' as D. Sneath puts it in his paper. The story of civilization is very different on the other side of the Mongolian border. Under the political restraints imposed by the Soviet Union, the Mongolian state was politically restricted in its efforts to promote nationalism. In 1928, under Soviet guidance, the Mongolian Revolutionary Party launched a huge nation-building program dominated by what Brubaker10 would term 'groupist' thought. This included installing paradigms of ethnicity and ethnic minority by which the Mongol population was divided into around 30 ethnic groups (yastan).11 This notion of subnational ethnic identities introduced a principle of division and diversity that could be seen to undermine Pan-Mongolist political positions, which the Soviet leadership saw in threatening terms. Anything that could be seen to advocate the unification of Mongolian-speaking populations in China and the USSR with that of the MPR was seen as unacceptable. Consequently, campaigns against notions of the uncultured and uncivilized nature of nomadic society could be pressed further in academic discussion, as described by Tsetsentsomon, than it could be in state policy. State policy regarding nationalism and wider categories implying cultural unity had to be kept within tightly prescribed limits. Nevertheless, as Tsetsentsolmon shows, the Mongolian state was appreciative of UNESCO support in promulgating notions of nomadic civilization from the 1970s onwards. With the collapse of the Soviet Union in 1990, the Mongolian state was free to promote its favored concept of civilization as part of its wider nationalist ideology. Regional and global power relations, then, have created the frame within which Mongolian claims for civilization have been constructed. The legacy of this historical construction is reflected in contemporary Mongolian public culture, in notion of ethno-national identity, and in the sensibilities of the consumer. The Mongolian sense of distinctive cultural heritage has fed into nationalist images of a discrete Mongolian genetic heritage, as explored by Eric Thrift in his paper on diary production and the discourse of ethnic purity. The importance of the wider set of global power relations remains in evidence here too, as attitudes towards diary produce reflects the grander narrative of the Mongolian and Chinese national entities. Here, we see that forms of political imagination, such as ethno-nationalism, are not somehow exterior to economic processes, but a fundamental influence on the perception of producers and consumers. Christopher Atwood's paper deals with the deeper past of claims to what have come to be seen as distinctive cultural identity. He shows that even at the time of the Mongol Empire, the history of the Öng'üt polity could be constructed in different ways and reflected different political agendas. Some accounts emphasized claims of religious and other forms of 'cultural' distinctiveness, and others stressed the commonalities and shared heritage of the ruling elite with other Inner Asian aristocracies. Here, we have new insights into the raw historical material from which various narratives could be constructed in the age of the nation-state, their claims of cultural difference and separate ethnic identity, or claims of inclusive membership in some wider Mongol or Turkic identity. The papers gathered in this special issue are diverse in that they offer in-depth studies of particular social forms or processes. However, they all reflect the importance of processes of historical and cultural editing, and a concern with the ways in which 'civilizational resources,' if they can be called such, have come to be represented in the era of nation-state politics. At issue is not the plausibility of some sort of 'clash of civilizations', but the ways in which various sorts of cultural and historical resources have been used to construct national and transnational visions of commonality and difference. Concepts of civilization remain central to these efforts, just as visions of history and culture continue to inform our understandings of the contemporary world. October 16 (infomongolia.com) The leading soloists of Mongolian State Academic Theatre of Opera and Ballet are invited to perform a gala concert on the stage of Bolshoi Theatre in Moscow, the Russian Federation. The single concert namely "Golden Voices of Mongolia" is scheduled at 07:00 pm by Moscow time on November 20, 2014. Mongolian troupe of soloists is comprised of Merit Artists E.Amartuvshin (baritone), B.Erdenetuya (soprano) and U.Uyanga (soprano), Frontier Cultural Servants E.Ankhbayar (baritone) and R.Dorjkhorloo (mezzo-soprano), and singers B.Gombo-Ochir (tenor), J.Byambajav (bass) and B.Batjargal (tenor). Moreover, Russian soloists of Bolshoi Theatre Merit Artist Elena Manistina (mezzo-soprano) and Anna Aglatova (soprano) will also co-stage the gala concert in association with the Russian National Orchestra under the State Prize Laureate, Conductor Mikhail Pletnev and Honored Artist, Conductor Alexander Polyanichko. October 15 (Weather.com) When photographer Brian Hodges was shooting in the east central Asian country of Mongolia "there was not a shortage of fresh scenery" to capture. "When taking pictures, I have a simple litmus test to determine whether or not it is worth stopping to make a photograph," Hodges told weather.com. "Basically, if I'm confronted with something I don't see every day, I force myself to stop and reflect. More often than not, these are the moments that yield the most interesting photos." Hodges had a lot of these moments in Mongolia when he was on a shoot for the book "Gypset Living," which allowed him to spend weeks exploring the country with the book's author Julia Chaplin. For the book, Hodges documented the everyday life of traditional nomadic societies throughout Mongolia. "When confronted with linguistic and cultural barriers, I approach strangers with an open heart and look them straight in the eyes to communicate my interest," he said. "Ultimately, this works just as well as sharing words. My process is simple – find beauty in everyday life." The Santa Barbara-based photographer has traveled the globe trying to capture those striking moments. "My photography has taken me to more than 50 countries… from Mongolia, to Papua New Guinea to Timbuktu," Hodges said. "Every experience is dramatically different and I always come home enriched by my travels." To see more of Hodges work visit his website. October 16 (The Northern Star) AMIE Dreyer, co-founder of adolescent counselling program Chrysalis, is just back from Mongolia after gaining an extremely high-flying supporter. 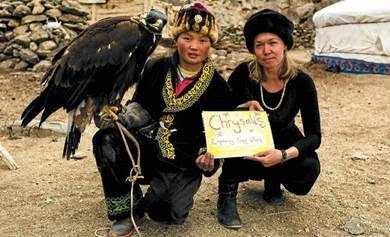 Amie was in Mongolia on a personal journey of her own, and her guide told her of the Golden Eagle Festival in the Altai Mountains. While in the region she met 14-year-old Ashol-Pan, the youngest eagle hunter and and only female eagle hunter in Mongolia. "Ashol-Pan did really well in the competition considering she was up against more than 70 male competitors who had been training their eagles to hunt foxes and wolves their whole lives," Amie said. "My interpreter told her about the job I do with Chrysalis, supporting more than 90 at-risk teenage girls in Australia, all who have experienced high levels of trauma. "Ashol-Pan was very empathetic and understood the importance of women supporting each other. "She and her mother were very happy to become advocates and symbols of empowerment and hope for all young women, uniting together around the world." Amie co-founded Chrysalis with Jane MCGowen in 2008 at Byron Bay High and the program recently won the annual Northern District Local Health Network Overall Quality Award. The program operates in five high schools across the Northern Rivers every week, offering group counselling sessions. "Over the last seven years we have engaged literally hundreds of girls from a diverse range of backgrounds," said Amie. "More than 90% of young women who have participated say Chrysalis has made significant and positive changes for them." October 15 (infomongolia.com) The "Bid Chadna Negdel" NGO in collaboration with "Brilliant" women's union and Ikh Zasag International University are organizing the first ever pageant contest for people with disabilities namely Wheelchair Miss 2014 in Ulaanbaatar on December 03, 2014. The December Third is an International Day of People with Disability and last year the NGO successfully organized the "Wheelchair Fashion" show and this year the show will be also hosted on this day. The winner of the contest will be elected as the Envoy representing Mongolian people with disability and be the first owner of the Wheelchair Miss Trophy, moreover, she will be awarded with a certificate to have a holiday with her family members in Italy. October 13 (Travel with Anjaly) Never mind that people say Mongolia is no place for vegetarians, and never mind that you can list out all the Mongolian dishes and each of its variations and still not cross fifty varieties in total, food here is wonderful, despite the repetitions you might find everyday. That is not say I did not get a little tired of dry noodles with dry meat and potatoes, but on the whole, I loved it all. The raisin drink is quite a treat – the drink is made from boiling raisins in water for a long time. At the end of the refreshing drink, you get to eat the residue! The fried dumpling is called Khuushuur and usually comes filled with meat. The famed "salty milk tea." You will be greeted with this (yup, no sugar) in every home or ger all over Mongolia. This easy to make drink is also easy to make. Airag: Fermented mare's milk, airag is not easily stomached but it is also a reflection of the long standing relationship of man and horse. It's worth a try for sure, tastes like a bad yogurt drink but gives you quite the kick. No wonder it also called the Horse Juice. Vodka: Mongolia, like any former Soviet Bloc country, loves vodka. Be it horse-milk vodka or the famous Chinggis Vodka so commonly sold everywhere. Mongolian cuisine has a lot of meat and fatty products, keeping in mind the harsh climate and the fat in their food helps withstand the cold.